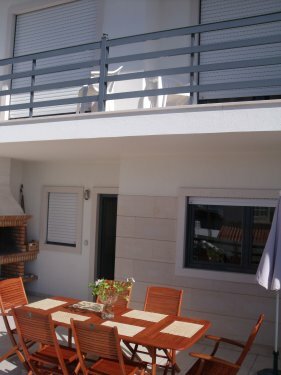 Casa Foz sleeps 6. in a 3 bedroom, 3 bathroom spacious, fully equipped modern house in the heart of Portugal's unspoilt and beautiful Silver Coast. The house is set in a quiet location close to local amenities and the lagoon/beach. The house has a large south facing terrace with brick BBQ, which, together with two of the bedrooms, have views over the lagoon and surrounding countryside. The master bedroom has an en-suite bathroom, and as with the other two twin rooms, has fitted wardrobes and ample storage space. 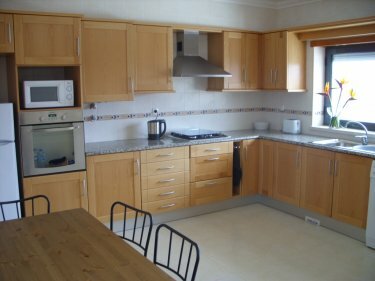 The large kitchen has everything you need for self catering. The house is in a condominium of four houses. 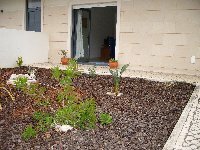 The house has 2 small landscaped gardens. 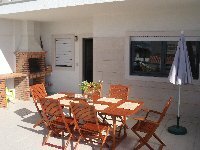 The house has central heating and is therefore ideal for exploring this beautiful region of Portugal off-season. Foz Do Arelho is 2 minutes walk. Golf nearby. The house is not suitable for more than six adults. Other information: The lagoon is 10 minutes walk, the beach 5 minutes further on. The lagoon provides safe bathing for children. It is also excellent for some watersports and fishing. There are numerous cafes/restaurants along the lagoon and beach. Foz beach is a fantastic strip of fine golden sand. 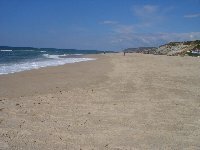 Other beaches such as Sao Martinho are 15 mins drive. There is a popular nightclub about half a mile away. Foz Do Arelho is 2 minutes walk. Foz is a village but has mini-market, bar/cafes, restaurants, health centre, tourist office, pharmacy, a bank and a fishing tackle shop. The house remains cool in the summer, but central heating is available for low season use. Our helpful, English-speaking agent can provide office facilities (internet/email/telephone access) and is available within walking distance. The house is situated on a quiet road, and parking on it is very safe. Accommodation: The house had beds and facilities for a maximum of six people only, although one or two extra infants could be accommodated using our agent's cots (available to rent). The house itself does not contain a cot or highchair. Long term rental discounts available on request. 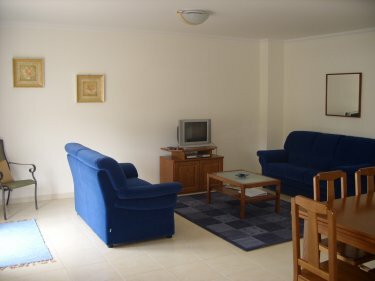 Minimum rental for Christmas/New Year is 365 euros. We do NOT charge per night. 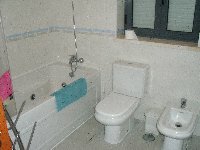 The minimum rental price is 275 euros, to cover fixed costs such as cleaning and linen.